The Russell Hobbs 20680 Buckingham Coffee Maker Advanced Showerhead Technology is the perfect way to get great tasting coffee when you deserve it. The advanced showerhead technology sprays water quickly and evenly through the ground coffee to ensure more of the coffee gets dissolved and a better extraction of the flavour to give you the perfect cup. The coffee maker can be set to make up to 10 cups in the 1.25 litre glass carafe but if that's too many then you can select the 2-4 cup option to ensure you don't waste coffee and the blue illuminated light ring comes on when the machine is brewing and stays on during the keep warm stage. 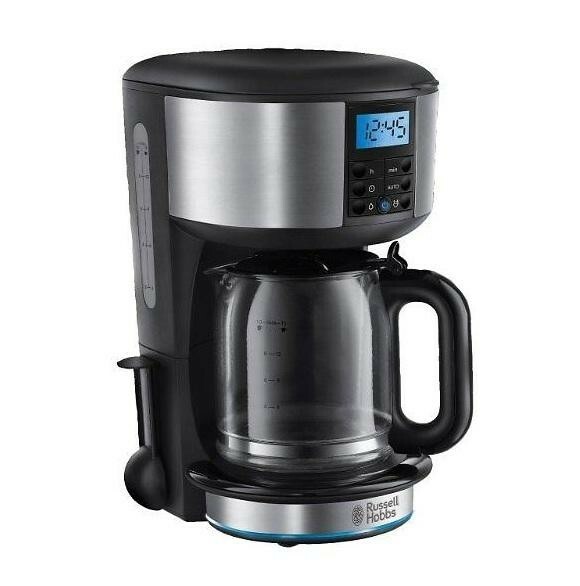 The 24 hour programmable timer enables you to select a time for the machine to automatically brew coffee for you so you can wake up to a fresh coffee every morning and the auto clean feature ensures you always receive a great taste.